He watches Hello, Dolly! on an iPod that he somehow hooked up to a VCR, emulating the dancing and learning about love. (That's not the only Apple reference in the movie: he makes the classic Mac bootup sound when he turns on, and his love interest EVE was designed by Jonathan Ive). When you see Wall-E try to imitate the dancing using a hub cap he collected just for that purpose, you know that this is more than a piece of machinery. Proving Pixar's raison d'etre, this little silent robot has more humanity in him than most movie characters played by actual humans. Immediately, we realize this isn't your typical kiddie cartoon. No pop culture jokes? No instantly-recognizable celebrity voices? A decimated, humanless landscape full of towers of garbage and decrepit buildings? A lonely robot trying to learn about love and humanity through centuries of its trash? This looks more like a beautiful, haunting sci-fi movie than a children's movie, because that's exactly what it is. And isn't that the sign of great science fiction? While on the surface it's a movie about robots and spaceships set centuries in the future, deep down it's about humanity and its place on Earth and in the universe. It uses its out-of-this-world settings and characters as a lens to reflect our own world back at us, showing us both the beauty and the ugliness of our existence through the eyes of a guileless, trash-compacting robot. In a movie season that's overpopulated with tired superhero movies, remakes and sequels, it's incredibly refreshing to see a movie that stands on its own as a completely new and unique creation. 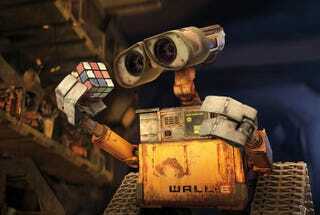 It's safe to say you've never seen anything like Wall-E, and you might not see anything like it again. Go. Go see it as soon as you can.